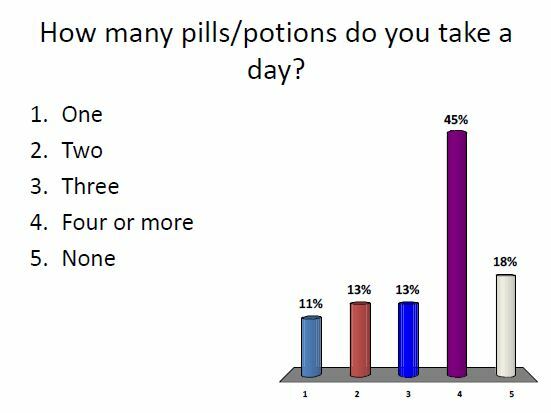 It’s not at all surprising to me that nearly half of our group are taking four or more pills a day. In the nursing homes I was involved with at ExtraCare Charitable Trust and indeed also in the retirement housing projects, the number of pills a person took was almost seen as a badge of pride. Bathroom cabinets bulged with boxes of pills, bottles of tablets, pre-packaged blister packs and in the nursing homes the daily medication round was accompanied by a trolley of goodies. The medication industry is a huge enterprise ably supported by a medical profession that has a pill cure for most things and a pill popping army of patients. I have been writing about pills almost since my first blog. You can see the first one by clicking in the Archive on September 2010 and looking at “A pill for everything”. You can then find all my subsequent “Pill” blogs and many of the cartoons that accompany them by clicking “PILLS” in the TAG CLOUD. This entry was posted in GRUMBLESMILES TRUST and tagged "A Health Ladder", CAFE PROJECT. Bookmark the permalink.